GEM's eDOT team is helping to organize the International Conference on Computing and Mission (ICCM), which is being held in the Netherlands in February. 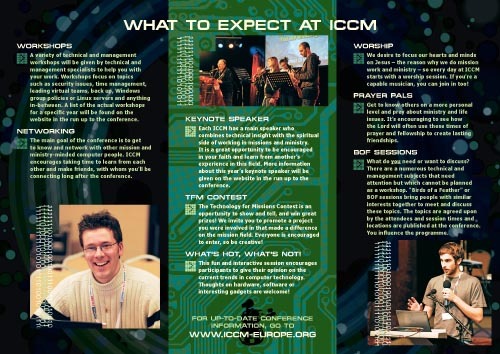 ICCM is a great opportunity for people in the ministry fields of computers and technology to network, discuss new technologies, share resources, offer encouragement, and fellowship together. 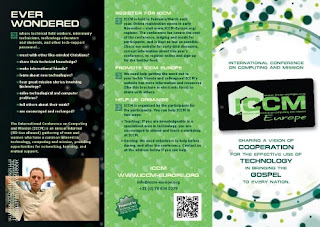 Our print team was asked to help them develop a brochure that could be used over several years, and point people to the ICCM website for registration, logistics, and other helpful information. Two of our GemStone Media team members are planning to attend and lead workshops at this year's conference.